Palmetto is a native St. Augustine grass cultivar selected for better color and finer texture than ordinary St. Augustine grass. Palmetto St. Augustine grass demonstrates superior shade, cold, frost, heat, and drought tolerance. This versatile turfgrass is used across the southern United States from the Carolinas to California under a wide range of climate and soil conditions making it the ideal choice for residential and commercial use. Palmetto grass is rapidly becoming accepted as a landscaping standard as it has been used in thousands of lawns since 1994. Please note that like all turfgrass, Palmetto St. Augustine grass is a living plant, not a miracle grass. When properly maintained, however, Palmetto St. Augustine grass will deliver years of an aesthetically pleasing and functional lawn. Palmetto grass is a semi-dwarf grass, giving it a plush appearance similar to Seville and Delmar, but Palmetto grass is less prone to becoming thatchy, even in full sunlight. The leaf blade width is similar to Bitterblue and Raleigh and finer than Floratam. When mowed high (3" - 4") it is often mistaken for fescue. The leaf blades are tapered at the tip with a rounded end, and are soft to the touch, unlike the prickly feel of Floratam. Palmetto grass will remain green longer than any other variety of St. Augustine, and will stay green much longer than Bermuda grass and Centipede grass. Palmetto grass will slowly become dormant after several heavy frosts, and will remain evergreen in temperatures below freezing if there are no hard frosts. It will first go "off color" (e.g., the bottom layer of stolons will maintain green leaves while the top leaves develop the brown tinge characteristic of frost damage) before it lapses into total dormancy. In many parts of the South (Zones 7 - 9), Palmetto grass will be semi-evergreen. Palmetto grass has demonstrated very good drought tolerance in field tests. Some turfgrass producers have been growing Palmetto grass in non-irrigated production fields since 1993, enduring droughts in excess of 2 months. Palmetto grass will wilt as any other St. Augustine grass, but will recover if water is applied. 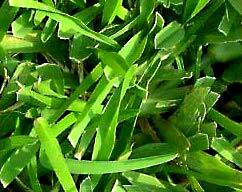 Palmetto St. Augustine grass has endured drought conditions as well as or better than any other variety of St. Augustine grass. Turfgrass producers have noted that Palmetto grass endured the East Texas drought of 1996 in non-irrigated production fields with few problems. This does not mean that supplemental watering will not be needed for lawns during periods of drought. More research into this characteristic is currently underway. St. Augustine grasses in general are known for their shade tolerance, and Palmetto has exceptional shade tolerance, even when compared to the most shade tolerant varieties of St. Augustine. In fact, this is the primary reason why Palmetto grass was initially developed In both field shade tests under trees and laboratory testing under canopies of mesh. When several other varieties of St. Augustine grass gradually declined, Palmetto sod thickness decreased only slightly and maintained a pleasing overall appearance with consistent color among areas exposed to varying amounts of light. Palmetto St. Augustine grass can perform well in shaded areas but must be established and maintained properly.